These resorts don't care that the ski season is supposed to be over by now. Conditions: Beach day! Bring your beers, burgers, bikinis and board shorts and post up A-Basin’s iconic beach. Check out: 17 Annual Festival of the Brewpubs, May 27: Sample beer from Summit County and beyond, and get down to Mojomama&apos;s Old School R&B and Funk jams. It’s the most wonderful time of the year—for skiers, at least. The end of the season brings sunshine, corn snow, cold beers, and countless ways to embarrass yourself in front of the entire resort. Good times. 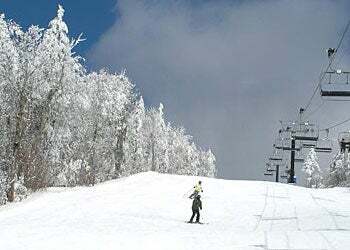 From late-season storms to pond skims and patios, spring skiing is winter’s most excellent parting gift.